For many years now London’s Wigmore Hall has been regarded as one of the world’s pre-eminent venues for recitals. A few years ago the management began to issue live recordings of some of the concerts given there and such has been the quality and consistency of these discs that Wigmore Hall Live has quickly established itself as one of the most valuable labels around. I’ve collected a number of extremely fine recordings of WHL song recitals but I venture to suggest this may be the finest yet. 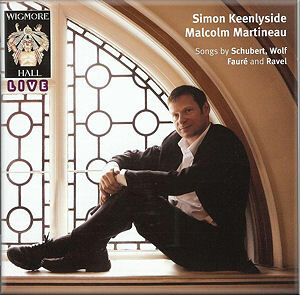 Simon Keenlyside has forged for himself a tremendous reputation on the operatic stage and in the recital room. Here, working in partnership with one of the finest accompanists on the circuit, he demonstrates that his reputation is fully deserved. From the very first bars of An Sylvia, which opens an intelligently planned Schubert group, it’s evident that the singer is on superb form. The phrases of Schubert’s much-loved lied are projected with firm, round, clear tone. The line is excellent and the voice is forward and expertly focused. Later in the group we hear an admirable account of Die Sterne. Everything seems just right about this performance. The singing is beautifully poised and the words are delivered with clarity and understanding. Pleasure in the performance is heightened appreciably – not for the first or the last time in the recital – by Martineau’s perfectly placed accompaniment. This is followed by a memorable reading of Himmelsfunken, in which both performers distil a potent atmosphere. The group ends with a plum from Schwanengesang in the shape of Ständchen. It’s a fine way to close a collection of Schubert lieder. Though this group opened the programme it receives the sort of ovation that many artists would be delighted to receive at the conclusion of their whole recital. There follows a selection of Wolf’s Möricke Lieder. Wolf’s often-complex lieder ideally require a singer with pronounced histrionic gifts as well as an infallible technique. In Keenlyside, with his operatic pedigree, we have an ideal Wolf interpreter. Immediately, in Der Knabe und das Immlein his gift for vocal characterisation is displayed. A little later comes An die Geliebte. I don’t disagree with Hilary Finch’s comment in the booklet that Keenlyside’s performance is “tenderly serene” but, in fact, I think that only tells part of the story for there’s passion in his delivery of the second stanza and he darkens his voice most effectively in the third stanza, while his tone at the very end of the piece is wonderfully elevated. This performance, to which Malcolm Martineau contributes in equal measure, is as impressive as it is expressive. Immediately after that the delicacy in the delivery of Auf eine Christblume II is delightful and provides a contrast with the previous item that’s surely deliberate. The group closes with the turbulent Lied vom Winde. This receives a powerful, dramatic performance and the demanding piano part is expertly realised by Martineau. Having demonstrated his prowess in lieder Keenlyside devotes the rest of the programme to mélodie. He opens his Fauré group with a delicious reading of Aubade. The performance of En sourdine is quite superb. Here Keenlyside fines down his tone significantly yet without in any way compromising the vocal quality. The rippling accompaniment, so typical of Fauré is judged to perfection by Martineau. Later on I relished the strong, passionate account of Fleur jetée and the eloquence with which Keenlyside invests that great, dark piece, Spleen. At the end of the group we hear Le papillon et la fleur. This was Fauré’s very first composition, written when he was a schoolboy, just sixteen years old. There’s not a hint of condescension in the winning performance given here: the artists lavish as much care on it as it they had been performing one of Fauré’s deepest, most mature pieces. Finally to Ravel and his quirky Histoires naturelles. Here, as Hilary Finch points out, the piano part is crucial in filling out the portrait of the bird or insect in question. Malcolm Martineau’s playing is right out of the top drawer, not least in the depiction of the regal peacock and in portraying the chattering of the cricket. The swan’s vocal line glides gracefully over the watery surface so keenly suggested by Martineau’s liquid accompaniment. But the tour de force of this performance is the penultimate song, Le martin-pêcheur (‘The Kingfisher’). Keenlyside and Martineau generate a tremendous atmosphere as the tale unfolds. Hilary Finch rightly draws attention to the singer’s “remarkable steadiness of line, and virtuoso breath control which recreates a sense of breathless wonder.” I bet the members of the audience didn’t dare so much as move during this mesmerising performance for fear of breaking the spell. It’s a phenomenal achievement. There’s just one encore but it’s a beauty. Poulenc himself described Hôtel as “the laziest song every written” and here it receives a performance of marvellous languor. As has been the case throughout the recital the excellence of the performance is such that in a way questions of technique are almost forgotten; yet time and again a superb detail catches the ear. One such is Keenlyside’s amazing use of head voice on the word ‘J’allume’ in this last song. This is a quite exceptional recital disc. Magnificently controlled yet deeply expressive singing and wonderful pianism combine in a deeply satisfying partnership. It’s an enthralling and hugely enjoyable experience from first note to last and one can only be grateful that this memorable occasion has been preserved and can now be enjoyed time and again and by a much wider audience. Even now, as I write this in early January, I wonder if 2010 will bring us a better song recital on CD. Somehow I doubt it.